Kes The Band, Etana, Barrington Levy, Bobby Hustle, The Green and more. This is the second hour of the 42nd installment of the Wild West Reggae Show on Q103 with Dj Marko! 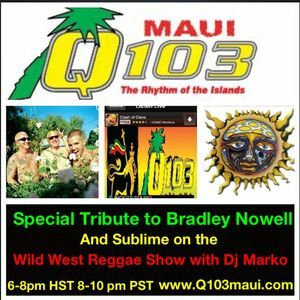 You can get all the episodes here and tune in live at www.Q103maui.com every Saturday from 6-8 pm Hawaii Time 8-10 West Coast Time right before Rebel Music with Irie Dole ! Enjoy!